While investigating the most recent robbery perpetrated by the infamous Mole Squad, April and the Turtles stumbled upon a secret meeting between the Mole Squad and Dr. Floyd O’Toole, a scientist who has been missing for weeks. In their effort to capture the Mole Squad, the Turtles underestimated their abilities and allowed them to escape with Dr. O’Toole’s Sonic Pulverizer, a device he developed as a tool not as a weapon. Frustrated that every criminal in town wants to use his inventions for evil purposes, Dr. O’Toole decides to give up the science life and become an insurance salesman. Until then, he has asked the Turtles to protect all of his research papers, and especially the video tape documenting his proudest achievement yet, the Hyper Thruster. Back at the lair, the Turtles lament the loss of Dr. O’Toole’s genius while Donatello reminds them that not all inventions have to have an evil purpose, like his Transdimensional Communicator, a device he created to stay in touch with the Neutrinos. Mentioning the Neutrinos reminds the Turtles that they have not spoken to them in quite a while and they decide to get in touch with them. When the do, it seems that the Turtles’ Dimension X buddies are in the middle of a chase scene with General Tragg and the Rock Soldiers. Over at Channel Six, Vernon sneaks into April’s office and takes the tape out of her camera in an effort to scoop her secret story. Without bothering to view it first, Vernon breaks into the regularly scheduled program with a Special Bulletin. What viewers all over the city and a couple down in the Technodrome get to see is Dr. O’Toole outlining his plans for his Hyper Thruster engine. Vernon stops the tape before it is complete. Krang is convinced that the Hyper Thruster engine should be powerful enough to life the entire Technodrome. Krang orders Shredder to get the tape. Shredder is reluctant, fearing certain interference by the Turtles if he should attack Channel Six. When General Traag contacts Krang announcing the capture of the Neutrinos, Krang realizes that he has the perfect solution to his immediate problem. By activating the Neuralizer, Krang is able to turn the sweet, fun-loving Neutrinos into the “Bad Seed Times Three”. Krang then orders them to take out their new found aggressions on the Turtles and they comply. That is except for Kala, she would rather trash the Technodrome. Krang orders Bebop and Rocksteady to stop her and in the process, they set off a high shrill alarm that equalizes the Neuralizer effect, causing Kala to return to her senses and escape. Over at Channel Six, while April is chewing out Vernon for airing the tape, who should arrive to claim it, but none other than Shredder. Bebop and Rocksteady tie up April and return to the Technodrome with Vernon. After finally discovering the secret to disrupting the effects of Krang’s Neuralizer, Donatello realizes that they need Dr. O’Toole’s Sonic Pulverizer and that they are going to have to find the Mole Squad’s secret hideout and liberate it from them. After a successful minor skirmish with the Mole Squad, they rendezvous with Kala at the City Park, where she informs them that she pretended to make up with Dask and Zak in her efforts to lure them to the Turtles. The Sonic Pulverizer does not work at first. While Donatello is busy trying to recalibrate it, Dask and Zak are chasing the Turtles all over the park, firing their StarMobile laser guns. Finally it works and Dask and Zak revert back to their lovable selves. The Turtles, along with the Neutrinos head for the Technodrome where they rescue Vernon. 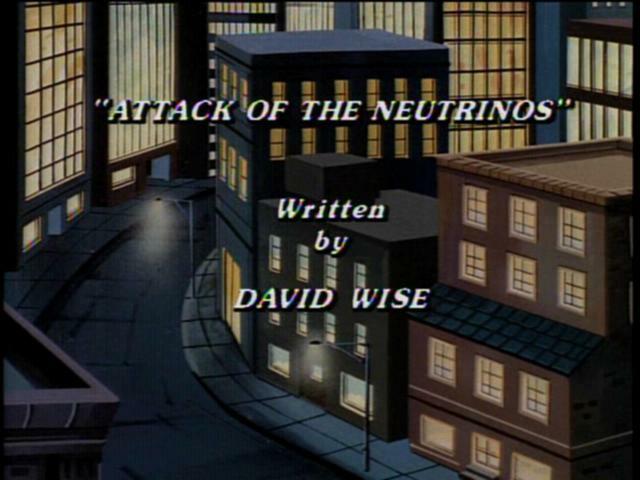 The Neutrinos head back into Dimension X.